Would you like to find out more about the Quest or how you can become more involved? Register for Discovering Partnership today and take the opportunity to see if partnership is the right next step for you! At The Quest we believe that life change happens best in small groups. We were not meant to do life alone, but instead have significant connections with others. Connect Groups are a great way to make this happen! Find out how you can get connected and grow in your relationship with God and others! Want some peace? Want to feel close? Want to feel valued? Want to discover the two key ingredients to a successful marriage? Then why not try some Love and Respect? Love & Respect reveals the secret to couples meeting each other's deepest needs. Attend the Love & Respect Seminar, and see what a difference this will make in your marriage! Have you been baptized? Do you have questions about baptism? Would you like to be baptized?Register today for the Discovering Baptism Seminar. We’ll answer the big questions and your questions. Then you’ll have the opportunity to be baptized at our Baptism Event on May 5th, if you decide baptism is the right next step for you. Children are a gift from God, and parents are given the responsibility to train and guide them. If you have a young child you would like to dedicate, join us for a Parent Seminar and then the opportunity to dedicate your child the following week. 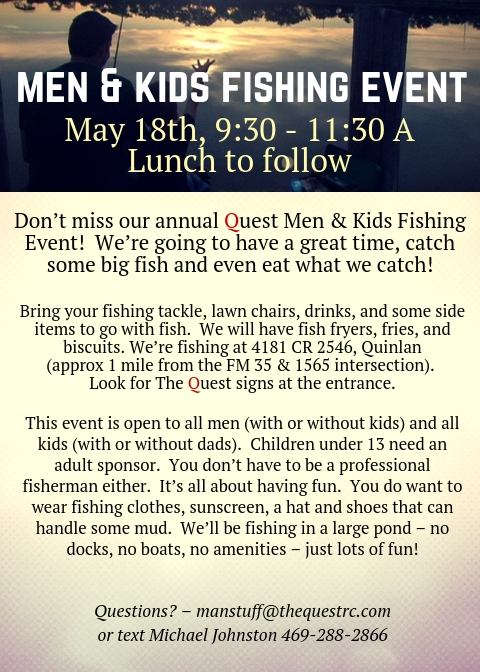 Don’t miss our annual Quest Men & Kids Fishing Event! Join us for a great time, while we catch some big fish and even eat what we catch! Whether you’ve visited The Quest once or several times, we would love to get to know you and let you know a little more about who we are as a church! Come check out Discovering The Quest on May 19! Invite your friends and family for a fun evening at the park! Bring your own food and games and join us at Harry Myers Park.